Provisioning Tokens to Swatch Watches in the Store: How SwatchPAY! Works | NFC Times – Near Field Communication and all contactless technology. 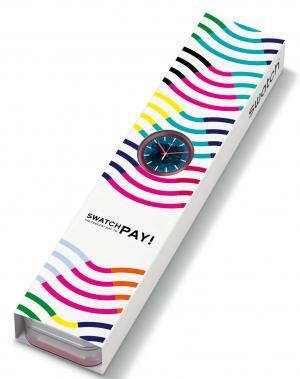 Swiss watchmaker Swatch plans to roll out its SwatchPAY! contactless payments service for budget-conscious consumers in Europe and likely beyond. The passive wearables require a special provisioning system. The Swatch watches support only one payment card each on their embedded contactless chips. And as passive wearables–which have no rechargeable batteries to power Bluetooth, Wi-Fi or even NFC controllers–they require a special provisioning system, for now using a dedicated NFC reader/writer to communicate with the passive contactless chips inside the watches. The readers are placed in Swatch stores. After a consumer buys an eligible watch, the store clerk or even the consumer herself would place the watch on the reader to receive tokenized card credentials sent from provisioning companies and loaded onto the banking-grade contactless chips in the watches. That’s after the user downloads the SwatchPAY! app on her phone and requests the tokenized version of her preferred debit or credit card (as long as it is participating in SwatchPAY!). Article has about 1190 words.